The specialist they sent was very helpful and quick. Highly recommended. I will definitely use them again and the staff is very friendly. David arrived on time. David fixed a main water pipe that had been accidentally severed. He was quick and clean. We recently moved to a new home and had issues with the sink and one of the toilets. 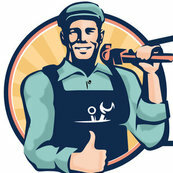 The plumber fixed it and provided fast service at a reasonable price.